NEW NOTES: Sirocco has a colourful new set of banknotes today with one notable exception. Alston, NCD, May 16 – The Ministry of Finance has shown off Sirocco’s new banknotes today, replacing Sirocco’s fifteen-month old “2011 series” notes. The banknotes were unveiled at around 4pm NZST this afternoon. The biggest change has been the demonetisation of the §500 note. Worth NZ$800, it was seen as unnecessary and cumbersome. 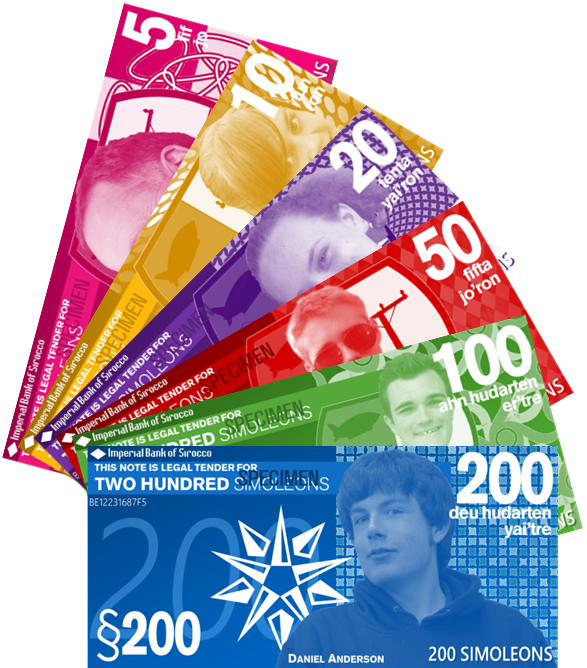 Other changes include the recolouring of the §5 note from grey to pink, the §10 note from purple to gold, the §20 note from orange to purple, the §50 note from gold to red, the §100 note from red to green and the §200 from green to blue. The faces on the banknotes are New Zealand Prime Minister John Key on the §5 note, Ambassador to Argentina Livia Aïrosser on the §10, Minister of National Services Chanelle Gibson on the §20, leader of the Dominion of Zona Nicholas Woode-Smith on the §50, Vice-Premier Jesse Coles on the §100 and Premier Daniel Anderson on the §200. The banknotes also feature their denominations in each of Sirocco’s national languages – English, Siroccan and Edallic. The §5 and §10 notes were seemingly the hardest to create – faces considered included Margaret Thatcher, Spike Milligan, Harry Secombe and Peter Sellers before Mr. Key and Miss Aïrosser were chosen. The Ministry has confirmed a new set of coins (of which the 10ȿ, 20ȿ and 50ȿ coins bear their value in decimals) are on their way and will be introduced within the next few weeks. The exchange rate between the simoleon and the New Zealand dollar of 62ȿ to NZ$1 and NZ$1.60 to §1 will not be changed. It was, however, pointed out that the style of writing the currency has been changed. From today it is no longer necessary to add the shilling sign (ȿ or s) for values §1.01 and over or use a decimal point to separate the simoleon from decimals and half-decimals (for example, §1.25 and §1.50 are now written as §1 2/5d (or §1.25) and §1 5d). The Ministry did urge those writing the system to ensure enough of a gap was left between the simoleon and the decimals to avoid confusion. Also pointed out was the difference between ȿ and s – when writing values less than §1 by hand, ȿ should be used and s used when typing, however the former is to be used if the computer has the proper support for it. The Imperial Bank of Sirocco (IBS) mentioned that the new “2012 series” are only to be printed by the Bank itself – collectors will have to acquire a genuine printed banknote from the IBS. It is rumoured the Government is considering de-decimalising the simoleon to replicate the old £sd system used in Australia until 1966, New Zealand until 1967 and Great Britain and Ireland until 1971. If and when this happens it is likely the new banknotes and certainly the coins will need to be replaced. The £sd system worked on the basis that twelve pence (12d) made one shilling (1/-), of which twenty made one pound (£1). Sirocco’s old banknotes and coins will be accepted until midnight on July 15, when the new money will take over. A guide to managing Sirocco’s banknotes and coins can be found here.